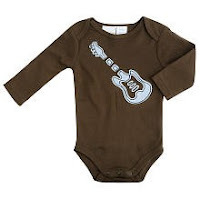 has led to a layette collection of over 60 onesies (of multiple sizes). How did this happen?! True to my life's goal and past actions, most of them were bought second hand, and definitely for $2 or less. Okay, I lied, I did spend up to $4 on a couple REALLY cute ones that were more of an outfit. It's so funny to me how I was so hesistant to start buying baby clothing, but once I started, I just can't stop. And it's not even yard sale season yet!! The only downside is that all the clothes are yellow, orange, green, tan, or white. When this baby actually comes, I am going to need pink or blue! I have bought a few blue things, justifying it'll be easier to girl them up if we have a girl, rather than to try to boy up a pink shirt. Plus, if we have a girl, I will just buy a really cute white headband to match every outfit. Pictured is one of my favorite Amy Coe outfits, which is actually a gift form soon-to-be Aunt Wendi! I had a really fun time looking at all the clothing last night while I was folding it and putting it away. I had Ty outfitted for an entire year before he even came to be! You'll be glad you did! It's therapeutic and rewarding. I remember when and where I was when I purchased most things and seeing Ty in them now makes me weepy.